Exciting news! My tax return is large enough to pay for a tropical vacation for my wife and I! The bad news is we will be using the return on more mundane endeavors, like paying off student loans instead. Stupid responsible decision-making! Maybe if I eat these Crispy Soy Brined Chicken Thighs everyday for a year I’ll be able to afford another vacation. 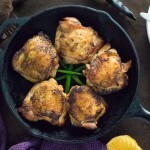 Chicken thighs are just about the most cost-effective family meal option after all! 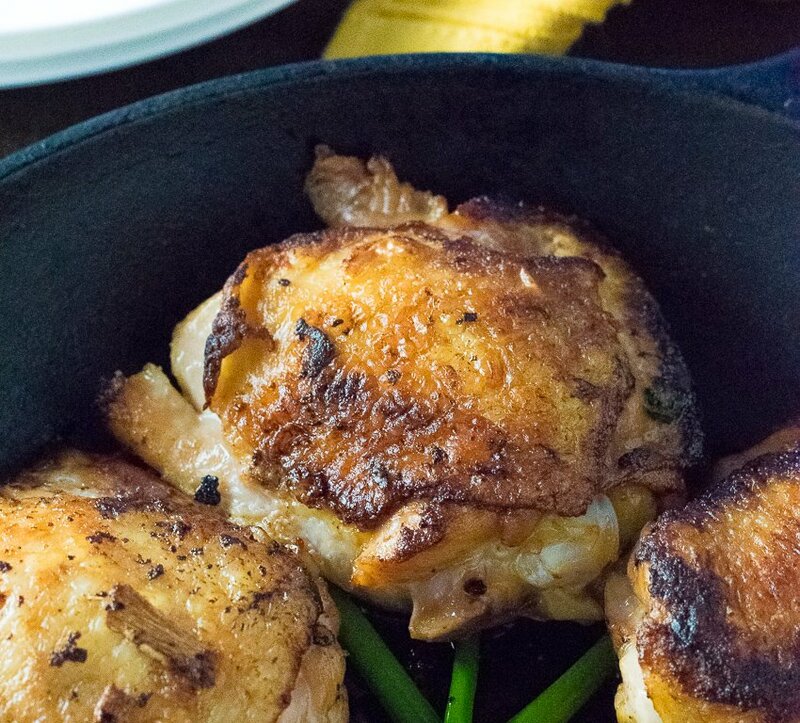 OK, so maybe eating the same thing for 365 days straight isn’t the best budget plan, but if you are looking to indulge in some outrageously crispy chicken thighs, this recipe won’t disappoint! The secret to these Crispy Soy Brined Chicken Thighs is the brine. There is no better way to infuse seasoning and flavor into meat than soaking it in a brine. The salty solution quickly penetrates the meat, locking in juices and flavor that remain even after it is cooked. Additionally, you won’t even need to add seasoning to the chicken skin; the brine will ensure it is delectably salty and crisp! If you never tried brining meat, you need to! This is a very similar brine to what I used in my Asian Brined Cornish Hen recipe. I am counting down the days to warmer weather when I can make that on the grill again! 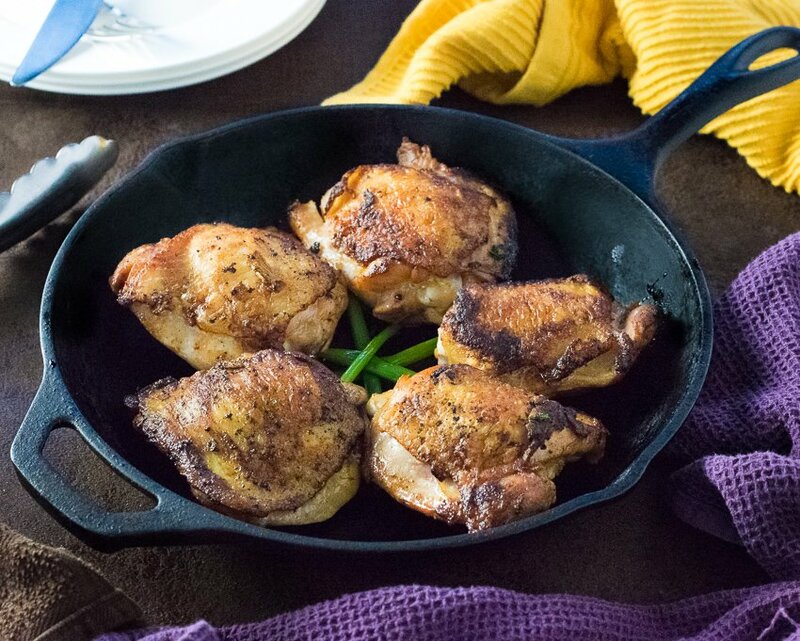 The mild taste of the Cornish hen is perfect for accenting the bright flavors of wasabi and ginger that linger inside the smoke infused meat. I specifically recommend using Morton Kosher Salt for this recipe. Why? Different brands of kosher salt have different sized grains which can affect how salty the brine is. Using Morton Kosher Salt will ensure your recipe turns out identical to mine. Additionally, I don’t recommend brining over two hours. Yes, it will add more flavor to the meat, but it will also get really salty. Chicken thighs naturally have a lot of flavor, the main purpose of this brine for this recipe is to season the meat and help it crisp while cooking! The above link is an affiliate link. 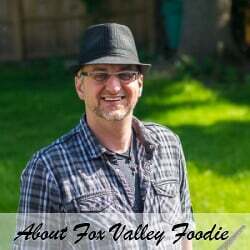 Any Amazon purchases made through this link helps the Fox Valley Foodie afford tropical vacations that he won’t actually go on. These Crispy Soy Brined Chicken Thighs yield tender juicy meat under shatteringly crisp skin. Best of all, the brine ensures each bite is perfectly seasoned from soaking in the flavor infused brine! Combine all brine ingredients into a saucepan and boil for 10 minutes, or until dissolved. Once the brine has cooled pour it into a food safe bag with chicken thighs, seal and refrigerate for two hours. Remove the chicken from the brine after two hours and pat dry. 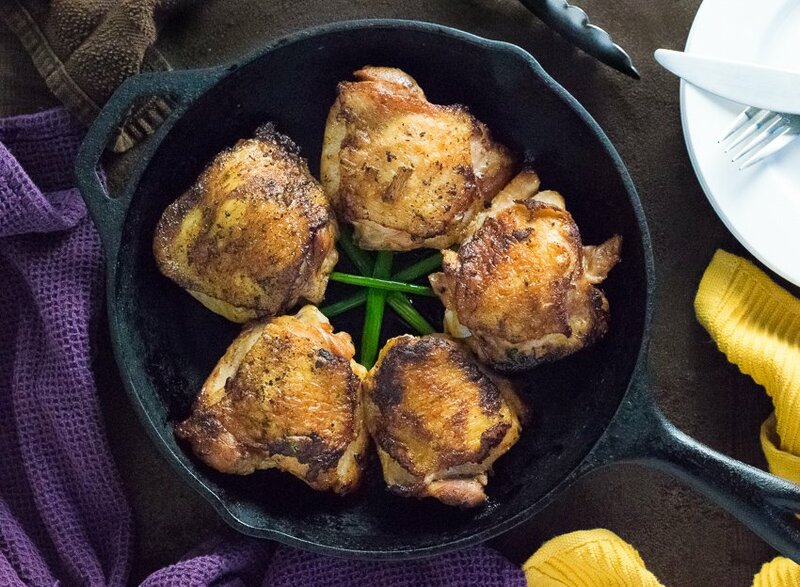 Heat oil in a skillet and add chicken thighs, skin side down, and sear on medium high heat for roughly 8 minutes, or until skin has crisped and browned. Place chicken, skin side up on baking sheet, or oven safe skillet drained of oil, and bake in preheated 450 degree oven for ~10-15 minutes, or until internal temperature reaches 165 degrees. Let meat rest for 5 minutes while it cools, and serve. If you enjoyed my Crispy Soy Brined Chicken Thighs recipe then you should probably like me on Facebook and follow me on Pinterest too. That’s what I would do at least, because if you don’t get to know me but you still use my recipe it is kind of like taking candy from a stranger, and your mom taught you not to do that. Don’t disobey your mom, subscribe to Fox Valley Foodie today. Liked this a lot! The salty skin paired so well with the moist interior meat. Will definitely be back for more.